From Calvin Roberts in Barbados Compliments of: Ansa McAl, P&P Insurance, Hanes (Guyana) Limited and Cellular Planet (Official dealers in Digicel phones) Guyana begins its defence of the West Indies Cricket Board (WICB)/TCL sponsored Regional Under-19 cricket tournament against the Leeward Islands at the Kensington Oval ground today and coach Hubern Evans yesterday stated that he was looking for a winning start. The second of two practice matches by the national women’s squad will take place today and tomorrow at the National Stadium at Providence. – GCB president Chetram Singh exhorts TCL youth team President of the Guyana Cricket Board (GCB) Chetram Singh on Tuesday night urged the Guyana TCL Under-19 team to return to these shores in one month’s time with the trophy symbol of regional youth cricket supremacy. -says Eastman, as war of words erupts at press conference By Calvin Roberts “I am like old wine, getting better with age.” Those were the words of Howard ‘Battersea Bomber’ Eastman at the press conference organized by the Guyana Boxing Board of Control (GBBC) to promote the upcoming card entitled ‘Judgement Day’ this Saturday at the Cliff Anderson Sports Hall (CASH). 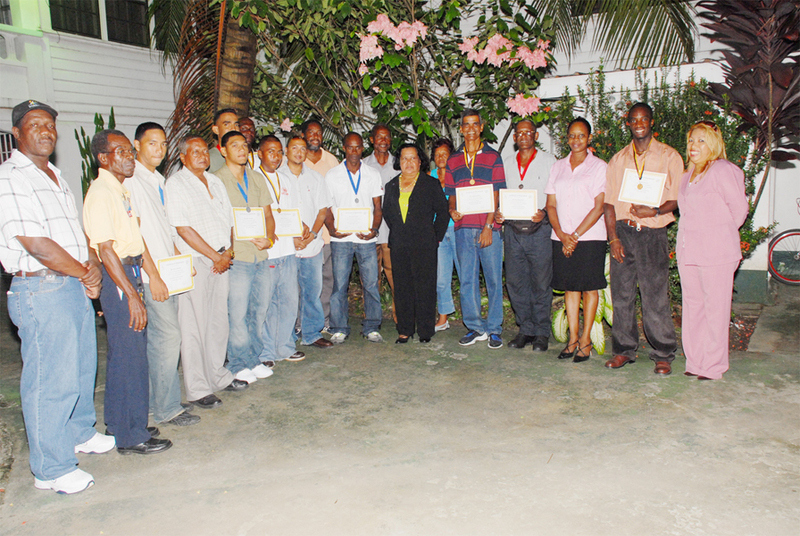 By Calvin Roberts The national road race champions on Tuesday night received their awards from the Guyana Cycling Federation (GCF) at a simple presentation ceremony at the office of the Guyana Olympic Association (GOA). 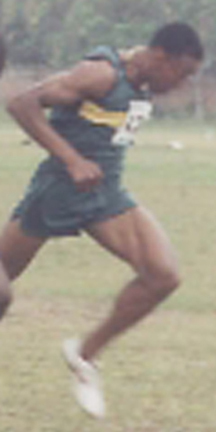 Guyana will be represented by a four-member team at this week-end’s Central American and Caribbean championships which began yesterday and will end on Sunday in Colombia, the Amateur Athletic Association of Guyana said yesterday. Smallbore captain Dale Hing came out on top in last weekend’s Safeway Security sponsored .22 pistol shoot competition organized by the Handgun Section of the Guyana National Rifle Association (GNRA) at the TSU range, Eve Leary. 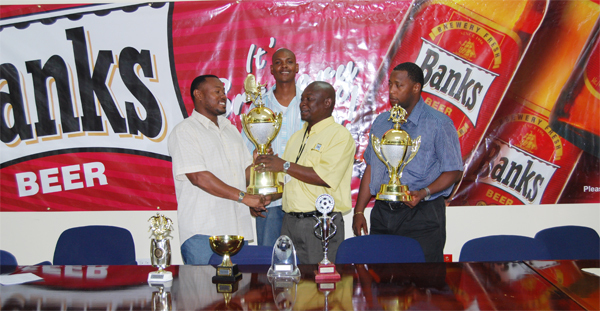 Bank of Guyana (BOG) managers took a comfortable lead after the first round of the three-way aggregate dominoes series against their counterparts from Neal and Massy and Republic Bank Ltd.
– little known Oslyn Collins selected instead of four-time Caricom 10k winner By Kiev Chesney Even before the dust had settled on the apparent `blunder’ on the part of the Athletics Association of Guyana (AAG) of not taking up the two free tickets offered to its athletes to participate at the Commonwealth Youth Games in Pune, India, later this year, the AAG’s poor administration has once again been revealed. 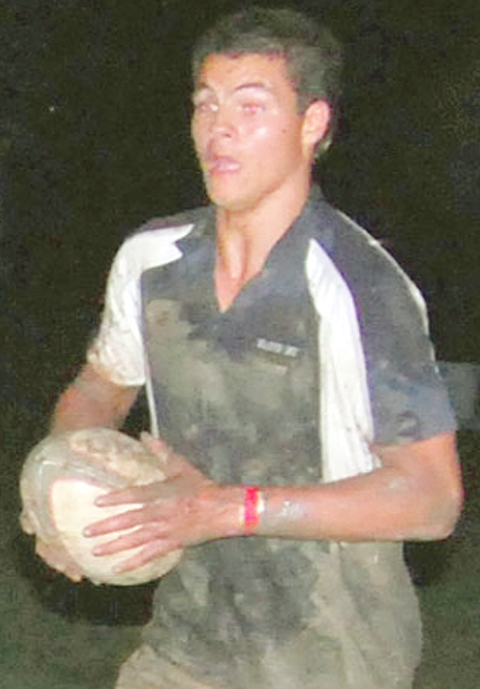 The Guyana Rugby Football Union (GRFU) has selected a team of 21 players to represent Guyana in the upcoming North American West Indian Rugby Association’s (NAWIRA) 2009 Under-20 Junior World Trophy Qualifier in Barbados from July 5-13. 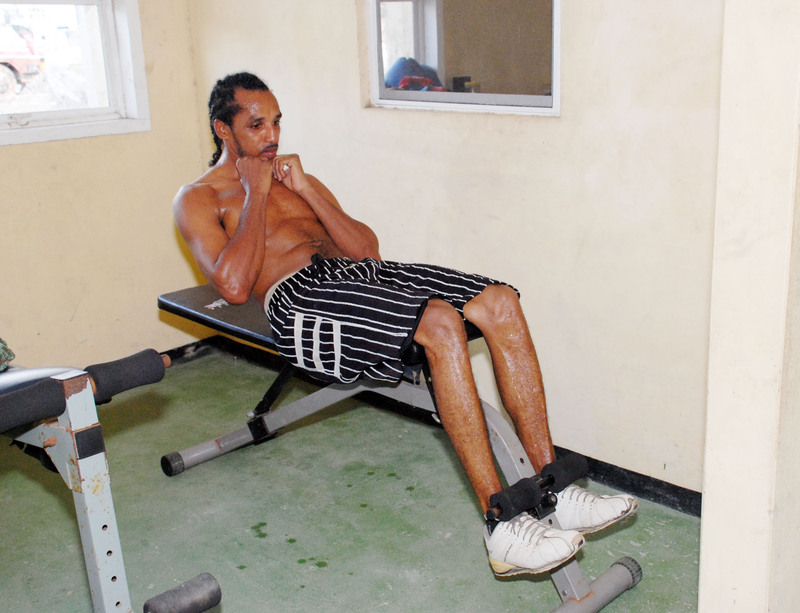 ‘Mc Rae could kiss the canvas’ – says veteran trainer Lennox Daniels By Calvin Roberts When Michael De Mattos takes on Trinidad-based Joel McRae over six rounds in his second professional bout Saturday in the Guyana Boxing Board of Control (GBBC) card titled ‘Judgement Day’ at the Cliff Anderson Sports Hall (CASH), his coach Lennox Daniels is predicting nothing but a victory. 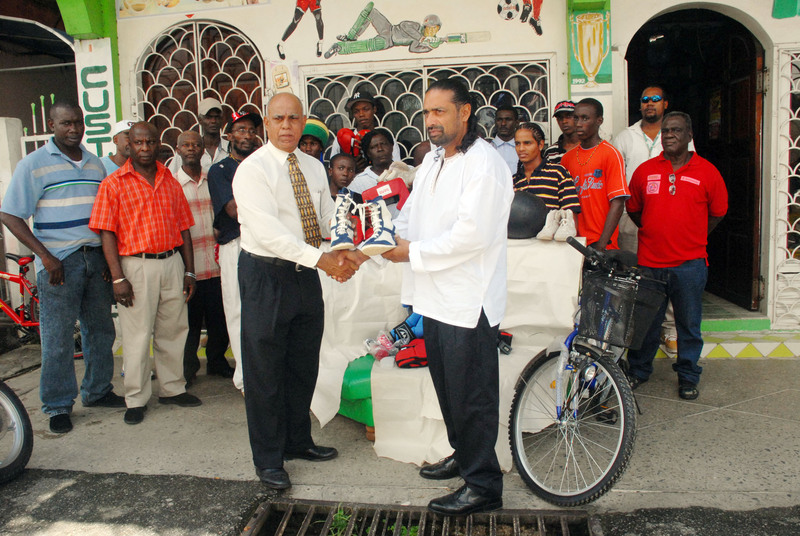 By Kizan Brumell Managing Director of the West Indian Sports Complex (WISC) Mohammed Feroze Khan yesterday handed over boxing equipment valued at $300,000 to the Guyana Amateur Boxing Association (GABA). By Calvin Roberts World Cup football and rain played havoc when the Georgetown Football Assoc-iation (GFA) made attempts to kick off their first division season a few weeks ago. 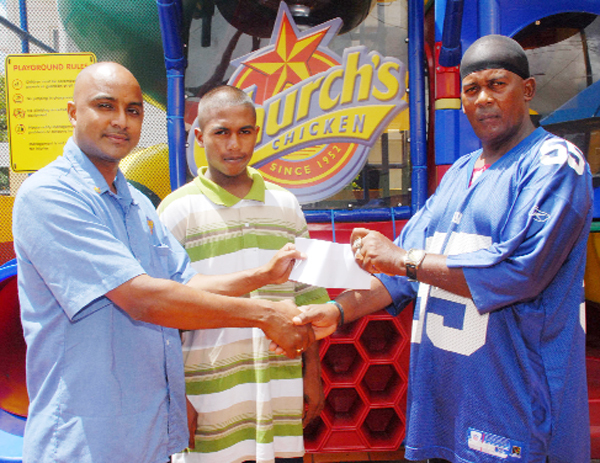 By Calvin Roberts Camex Restaurants Incorp-orated, owners of Church’s Restaurant chain, yesterday presented to president of the Flying Ace Cycle Club in Berbice, Randolph Roberts a cheque for $94,000 as sponsorship for the club’s upcoming Caricom Day 40-mile cycle road race. 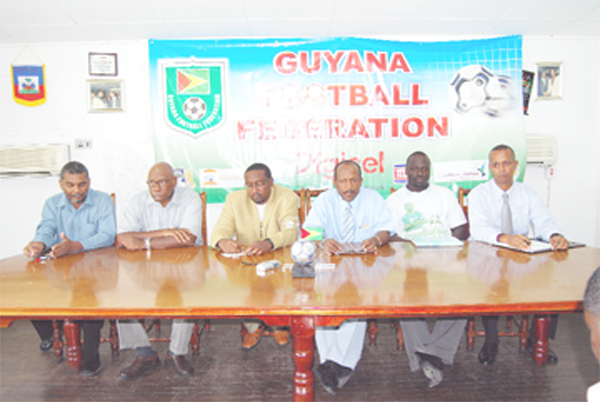 The Guyana Football Federation (GFF) has called to practice a 29-member squad for Guyana’s upcoming participation in the Caribbean Football Union Youth Cup Boys under-17 Qualifiers to be hosted in Trinidad and Tobago in August. 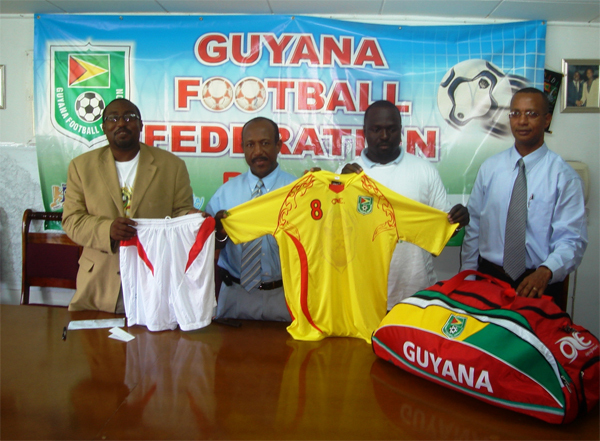 It was a historic day in the history of football in Guyana when the Guyana Football Federation (GFF) obtained official equipment sponsorship for the Golden Jaguars, so it is safe to say that they (GFF) gained a lot during the recently concluded Guyana/ Suriname 2010 World Cup qualifier. 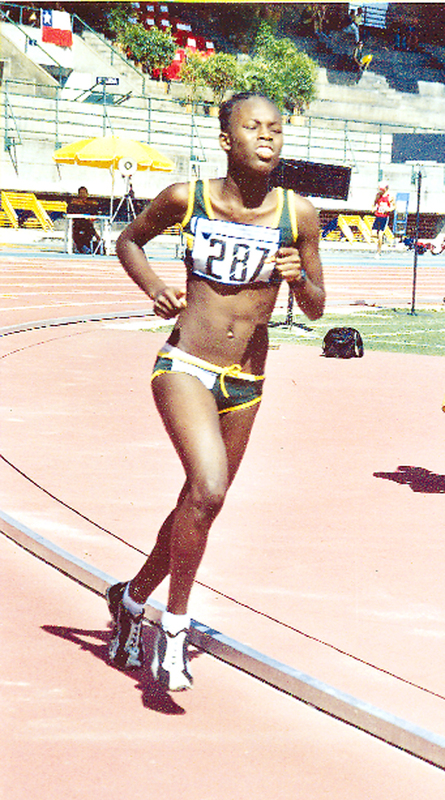 Caribbean junior girls’ champion Michelle John will depart Guyana sometime this week for Halifax, Canada to participate in the Pan Am Youth qualifying championships. 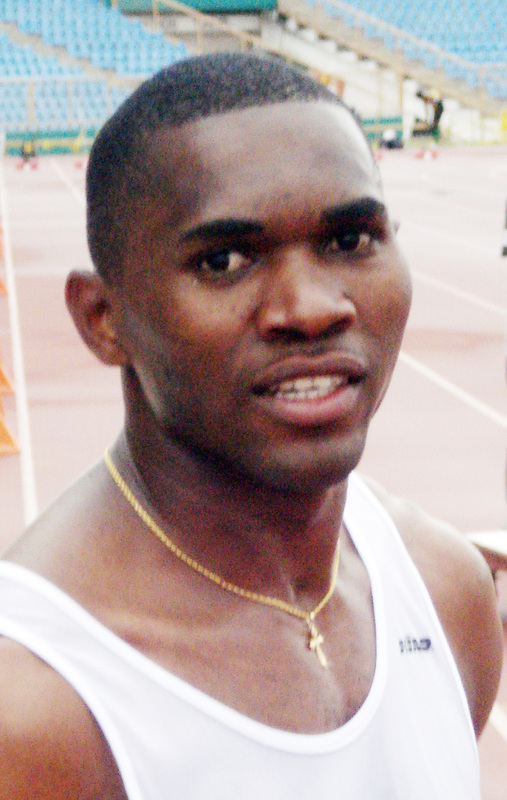 – Leslie Black says AAG has no respect for its athletes By Kiev Chesney Middle and long distance coach Leslie Black has came out swinging at the Athletics Association of Guyana (AAG), blaming the body for what he sees as poor administration which he maintains is responsible for Guyana not producing world class athletes despite the obvious talent. By Calvin Roberts Continental Cycle Club’s Alonzo Greaves along with Roraima’s Darren Allen and Tyrone Hamilton will depart these shores on Wednesday for the island of Anguilla where they will represent Guyana in the John T Memorial 80-mile cycle road race on Sunday. 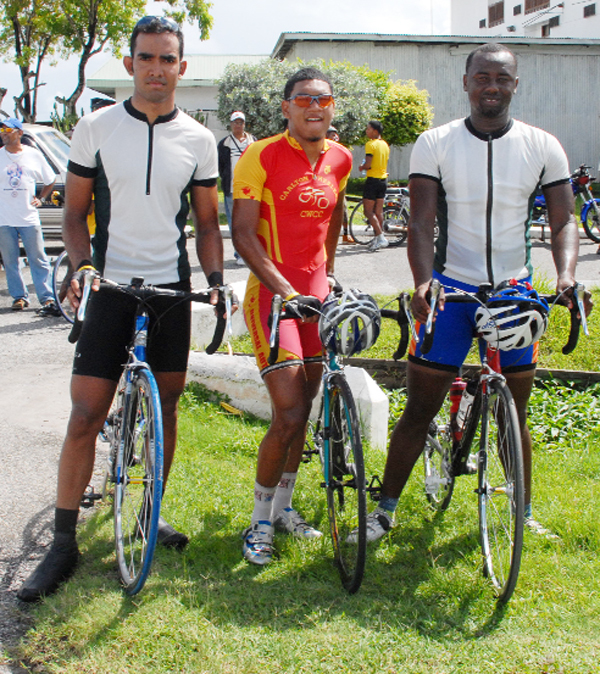 By Calvin Roberts Berbicians Neil Reece (Junior) and Gary Benjamin (Veteran) and Linden’s John Charles (Senior) were crowned the Guyana Cycling Federation (GCF) 2008 road race champions when they upstaged the defending champions in their respective categories yesterday morning. By Kiev Chesney Regionally-renowned middle and long-distance athlete Alika Morgan overcame stiff regional competitors and a tricky course to claim her fourth consecutive win at the Caricom 10k race yesterday in Antigua and Barbuda. 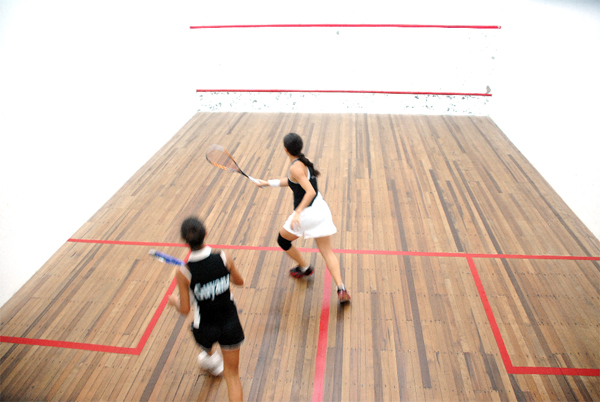 By Kiev Chesney It was expected that Guyana’s top female squash player Nicolette Fernandes would win the women’s singles title at the Georgetown Courts Saturday night. ……owes football answers By Orin Davidson in New York Call it what you may – fantasy or pipe-dream – the reality is that the joy evoked from the national football team’s performance was only fleeting. National player Jerezeno Bell went on a goal spree scoring a whooping 17 goals in one match to pilot reigning Diamond Mineral male hockey champions Everest Hikers to a destructive 21-1 win over Old Fort on the fourth evening of action in the Guyana Hockey Board Warm up six-a-side tournament at the Cliff Anderson Sports Hall Thursday. 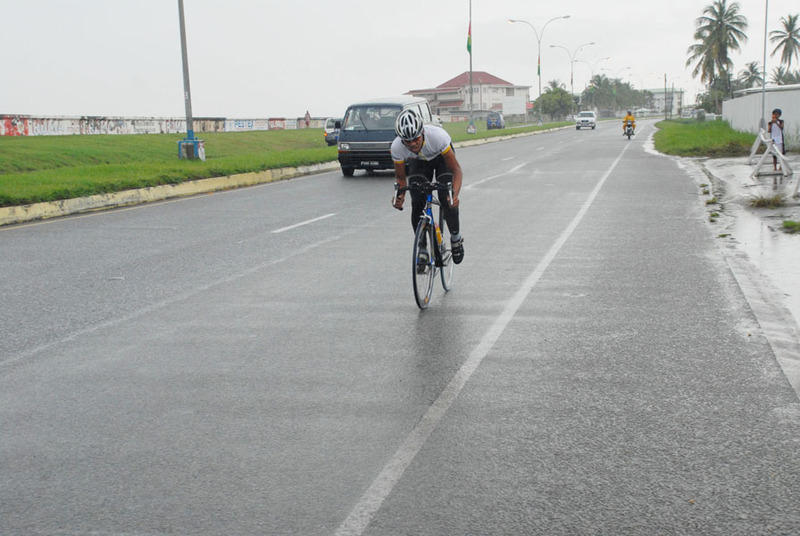 Christopher Holder in a time of 10:32:90 won the junior time trial organized by the Guyana Cycling Federation (GCF) in preparation for the upcoming Junior Caribbean Championship set for July 11-12 in Curacao. 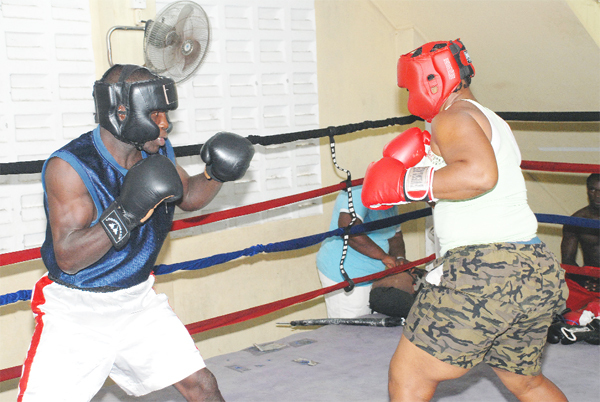 It will be a moment of truth in the boxing ring when local boxing star ‘Deadly’ Denny Dalton faces Howard ‘Battersea Bomber’ Eastman on Saturday at the Cliff Anderson Sports Hall for the national middleweight title on the Guyana Boxing Board of Control (GBBC) promotion card dubbed `Judgement Day.’ Dalton was scheduled to face former two-time world title challenger Raul Frank, but Frank pulled out owing to a back problem that paved the way for the board to offer Eastman a chance to fight for a local title in Guyana for the first time. Raul Frank might have pulled out but his replacement to fight `Deadly’ Denny Dalton for the national middleweight title of Guyana is – based on his past record – a more formidable opponent. By Calvin Roberts Moonchan Sankar, Herlando Allicock, Stefan Gouveia, Rondell Douglas, Clevon Rock and Akeem Alexander are all junior pugilists in training to represent Guyana at the upcoming Caribbean Cadet Junior/Female Boxing Championships in Trinidad next month. 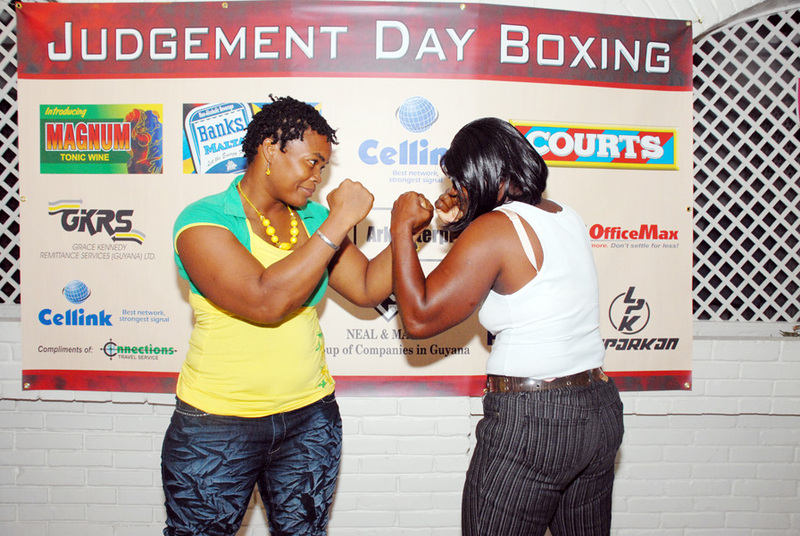 By Calvin Roberts When Pamela ‘Grenade’ London goes up against Veronica Blackman in their female heavyweight clash on the Guyana Boxing Board of Control (GBBC) boxing card titled ‘Judgement Day’ on Saturday she is going with one major assurance on her side, God. By Kiev Chesney Defending champion and three-time winner of the Caricom 10k road race Alika Morgan will look to make it four-in-a-row when she competes at the event in Antigua today. By Calvin Roberts Heavy overnight, early morning and midday showers left the Mackenzie Sports Club (MSC) ground in such a condition that the executives of the Upper Demerara Football Association (UDFA) were forced to cancel their replay of first round matches Friday night. The J.C. Chandisingh Secondary School on the basis of some brilliant teamwork and the loud vocal support of their coaching staff and students came from behind and defeated Lower Corentyne Secondary School in the final of the Berbice Cellink sponsored Inter-Secondary School Volleyball tournament at the Area ‘H’ ground. Pollard emerges from testing deGroot encounter Former national champion Regan Pollard booked his place in the semifinals of the Guyana Squash Association/GT&T Senior National Squash Championships after closing out Raphael deGroot in four games, in their highly contested and entertaining match on Thursday evening at the Georgetown Club. -Jeffrey stops Nicolette’s man-slaughtering crusade After brushing aside two male opponents, international squash star Nicolette Fernandes was stopped by reigning under 19 champion Kristian Jeffrey who represented his gender to the fullest by sending Fernandes packing in three straight games in last night’s semifinal of the Guyana Squash Association/ GT&T Senior National Championships. Following the success of the first National Legacy run which was held last year before the 2007 Cricket World Cup, the National Sports Commission has decided the second annual Legacy Run tomorrow morning at 6am, which will usher in Carifesta X.
Sheik Mohammed, Thakur slam half centuries Half centuries from former national wicket keeper/batsman Sheik Mohammed and Ramesh Thakur highlighted the latest round of matches of the Guyana Softball Association (GSA) Banks DIH-sponsored 15-overs-a side competition which continued last Sunday. 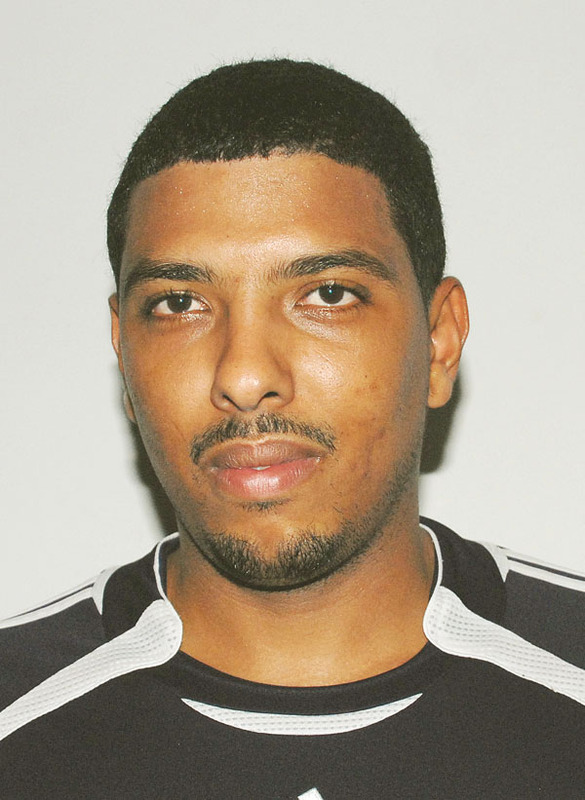 Georgetown Cricket Club (GCC) men’s `A’ team surged ahead in the points standing with their ‘B’ side in hot pursuit after the third night of action in the Guyana Hockey Board’s warm up six-a-side indoor tournament at the Cliff Anderson Sports Hall. 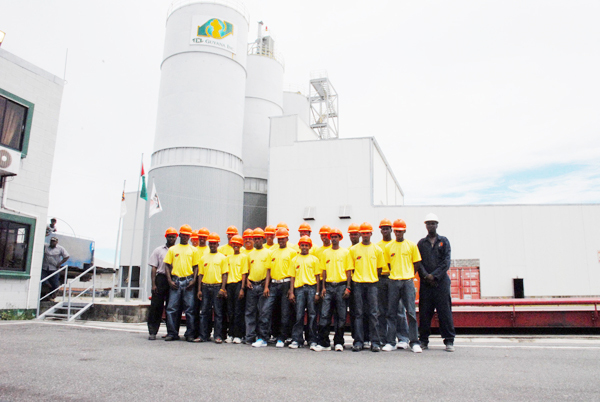 – coach Evans By Calvin Roberts “I need to see the batsmen stand up and be counted.” So said coach of the Guyana TCL Under-19 team Hubern Evans yesterday during a tour of the Guyana TCL plant by the national under-19 cricket team. The managers of Neal and Massy Guyana Group, Banks of Guyana and Republic Bank Ltd.
By Kiev Chesney With 13 years of rugby already under his belt, the newest addition to the Guyana under-19 rugby squad, Rupert Giles, will certainly be an asset to Guyana’s team at next month’s North American and West Indian Rugby Association (NAWIRA) International Rugby Board (IRB) Junior World Trophy qualifiers in Barbados. -Fernandes disposes of first male opponent Joe Mekdeci became the first male to exit the Guyana Squash Association (GSA) Guyana Telephone & Telegraph-sponsored senior national championships by the delicate but deadly hands of the lone female in this year’s men’s category, Nicolette Fernandes on Wednesday night at the Georgetown Club. ‘I am mentally and physically prepared for the defence of my middleweight title against whoever it is, whether it is Eastman or Raul Frank or whoever they put in front of me’By Calvin Roberts The Guyana Boxing Board of Control’s (GBBC) Judgement Day card is fast approaching and `Deadly’ Denny Dalton is mentally and physically prepared for the defence of his national middleweight title against Howard Eastman, the boxer told this newspaper yesterday. 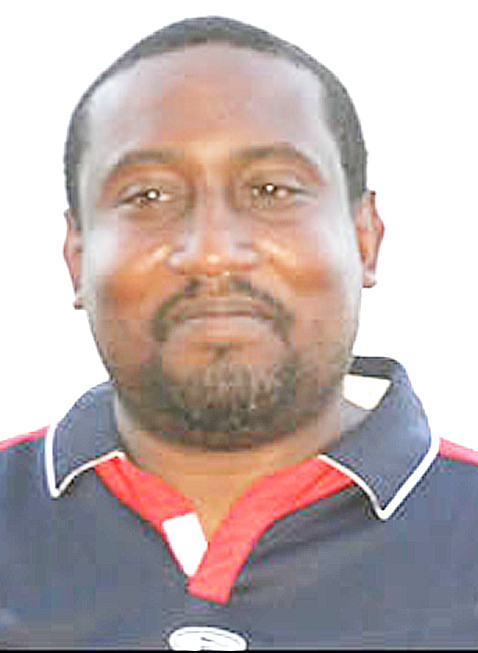 By Calvin Roberts There will definitely be some new faces on the Guyana senior team that will be contesting the upcoming Digicel Caribbean Cup which is slated to commence in August, according to president of the Guyana Football Federation (GFF) Colin Klass. 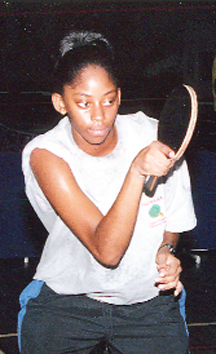 By Donald Duff Guyana’s top female table tennis racquet wielders Trenace Lowe and Michelle John have qualified for the Pan American junior championships set for Halifax, Canada from July 7-11. 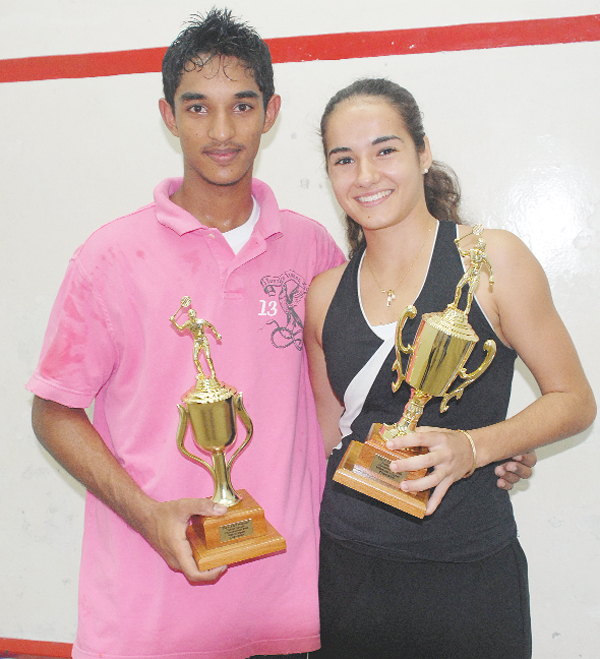 Juan Carlos Lazo upsetted Nicholas Naraine when action in the much anticipated, Guyana Telephone and Telegraph Company (G T & T) sponsored National Senior Squash Championships served off on Tuesday evening at the Georgetown Club courts. 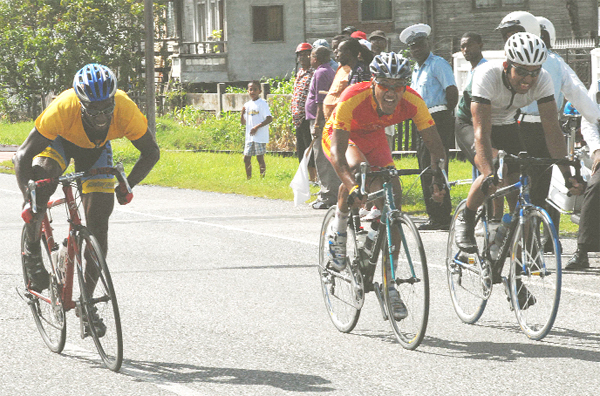 Cyclists in the country will be back in their saddles this weekend when the Guyana Cycling Federation (GCF) stages its Annual Cycling Championships for junior, senior and veteran riders. Georgetown Cricket Club `A’ will look to increase their lead when they square off with Everest Hikers `B’ in a men’s fixture when six more matches in the Guyana Hockey Board warm-up six-a-side hockey tournament will be played this evening at the Cliff Anderson Sports Hall. 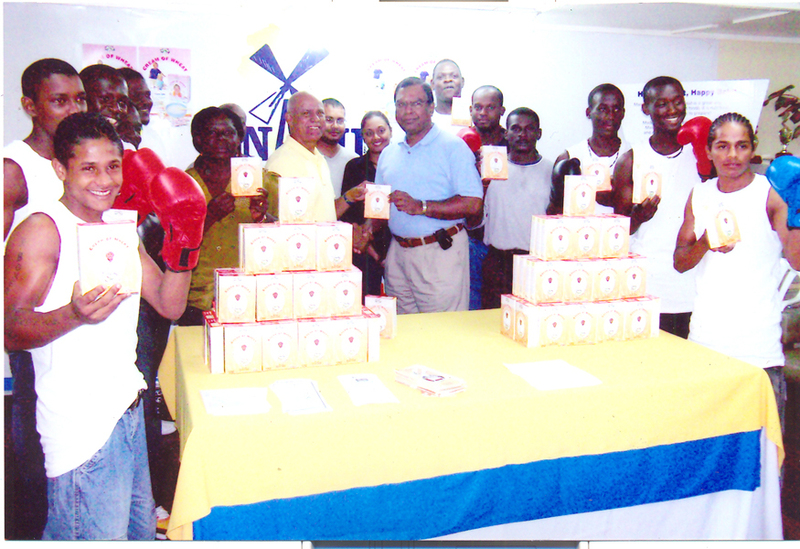 By Kizan Brumell Bakewell, manufacturer of the best breads in Guyana officially became a sponsor of the Rose Hall Town Youth and Sports Club (RHTYSC) in 2000. –Greene By Kiev Chesney Guyana’s top sprinter (locally-based) Rawle Greene moved a step closer to qualifying for the 2008 Beijing Summer Olympic Games when he clocked his personal best time in the 200m at the Trinidad National Senior Championships last weekend at the Hasley Crawford Stadium. By Kiev Chesney Linden’s Nicola Jacobs’ performance helped her team blowout the New Amsterdam ladies 75-39 when the Guyana Amateur Basketball Federation Inter Sub-Association Championships continued on Saturday evening at the Cliff Anderson Sports Hall.